Newly elected Rep. Sharice Davids is most proud of setting up a congressional office in part of her Kansas district she said hadn't seen one for years. For Georgia Rep. Lucy McBath, her biggest victory was passing the gun background checks legislation she advocated for after her son's shooting death. And for New York Rep. Alexandria Ocasio-Cortez, her top achievement was the introduction of the landmark Green New Deal. As the Democratic freshmen lawmakers round the first 100 days of their new majority in the House, they're taking stock of their accomplishments, noting the stumbles and marking their place as a front line of resistance to President Donald Trump. 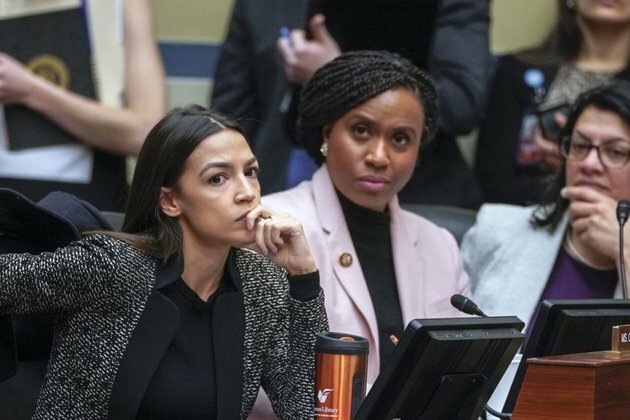 'When I came here, I said the days of business as usual in the Congress are done, and I think that's what we've seen,' said Rep. Lauren Underwood, D-Ill., a nurse and former Obama administration official, who took over a GOP-held seat in the Chicago suburbs. The first 100 days is often a milestone for a new Congress an automatic, if arbitrary, moment to assess the workings of the legislative branch. This year, it's even more noteworthy because of the historic nature of the freshmen class. It is two-thirds Democrat, with more women than men on that side of the aisle. It's also the most diverse ever , with many newbies swept into office in a blue wave that followed two years of Trump. House Democrats set out an ambitious agenda with legislation on the kitchen table priorities that helped them win the majority protecting the Affordable Care Act, imposing new ethics rules while engaging in aggressive oversight of the Trump administration. Their investigations extend well beyond special counsel Robert Mueller's probe into Russian interference in the 2016 election as they dig into the president's business dealings and push for Trump's tax returns . But with the spotlight comes high-profile setbacks. Democrats splintered over Ocasio-Cortez's climate change proposal and exposed party divisions over Israel's treatment of Palestinians. One new lawmaker, Rashida Tlaib of Michigan, stunned some when, on Day One, she told supporters using an expletive that the new majority would impeach Trump. Moreover, few of their bills will ever be signed into law. In fact, most are simply resolutions that are being panned by the Senate, where Majority Leader Mitch McConnell is providing backstop with his Republican majority to keep the measures from ever making it to Trump's desk. House Republicans gathered on the Capitol steps for their own 100-day event, ridiculing the new majority for catering to their liberal left flank and failing to keep their campaign promises. Another Republican, Minority Whip Steve Scalise of Louisiana, warned that Democrats are veering toward socialism. As he did, a passer-by among the crowds of tourists outside the Capitol shouted, 'I stand with Ilhan!' a reference to outspoken freshman Rep. Ilhan Omar of Minnesota. Democrats know they face challenges ahead, not only in avoiding the internal divisions that stymied House Republicans when they were in power but also in delivering on their campaign promises. Freshman Rep. Tom Malinowski, a Democrat who will face a potentially tough re-election in New Jersey, says part of the majority's job is to at least show voters what's possible. Many of them say they know theirs is a historic moment, even amid the everyday challenges of being new on the job. Underwood, who gathered the freshmen to make a video showcasing what they were most proud of, acknowledged the hurdles ahead. 'Moving forward, we will need to continue to work not just to pass bills in the House but do things that can gain broad support so that they can get enacted into law,' she said. Mexico City News.Net's News Release Publishing Service provides a medium for circulating your organization's news. © Copyright 1999-2019 Mexico City News.Net - Mainstream Media Ltd. All rights reserved.